One look at the Austrian-designed Noctua and you know it means business. For a start, it's something of a giant, featuring two fin stacks and two fans. The quality of engineering is superb, right through to the colour instructions. Even the thermal paste is 'award-winning' thermal paste. It looks the business, in a no-nonsense way. Only the hospital beige-coloured fans spoil the party here. Compared to the design excesses of Fenrir, Yasya and Thor's Hammer it looks positively clinical. The fittings continue the theme. They're top-notch, over-engineered and cover all possibilities of AMD and Intel boards. You even get the screwdriver you'll need to fit them. Once on, it's on good and firm. A word of warning, though: the sheer size means you'll probably be covering a RAM slot, and with just 53mm clearance your stick's heat spreader could spoil the fun, as it did in our test rig, forcing us to remove a stick. This is for big full-size boards and cases only. The performance though was excellent. Under idle conditions, our test rig ran at just over 41 degrees. This is about as good as we've seen. Only Xigmatek's Thor's Hammer managed to match this. Under load, it's just as capable. Here it ran at 53 degrees, and only Titan's Fenrir could keep up. 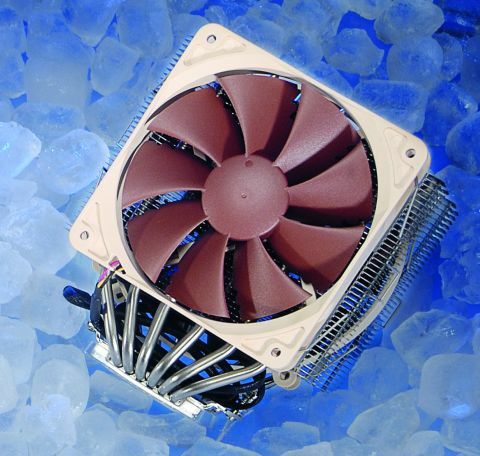 For sheer cooling power, it's hard to beat – as well it should be, given the bulk and twin fans. We were even pleased by the price. It's not cheap for sure, but considering the quality it isn't too bad, either. A high-end gaming system can reach £2,000. In this context, splashing out £60 on the cooler is just 3% of the budget. And you'll certainly be able to explore the outer reaches over overclocking. The construction and performance mark the Noctua out as something special. If you need serious cooling and are looking for something that puts substance over all other considerations, this is it.